Marketers are challenged daily with identifying and segmenting the interest and intent of their users and prospects. All that leads to more Efficient and Effective marketing campaigns and Higher Conversions and Sales. DEMANDED by users and prospects whom have grown to expect it. Social widgets and Social Login are known to increase website Opt-Ins and Registrations providing easy and fast alternatives for authenticating online users and collecting valuable permission-based, rich, first-party user data. Give your users and prospects a reason to Opt-In and Register on your website. Leverage valuable permission-based, rich, first-party user data collected via our Social Widgets to Segment users based on Identity data and behavior on your website. Gain insight and improved understanding of your users and prospects. All the permission-based, rich, first-party user data is stored in an always current database of your users and prospects. 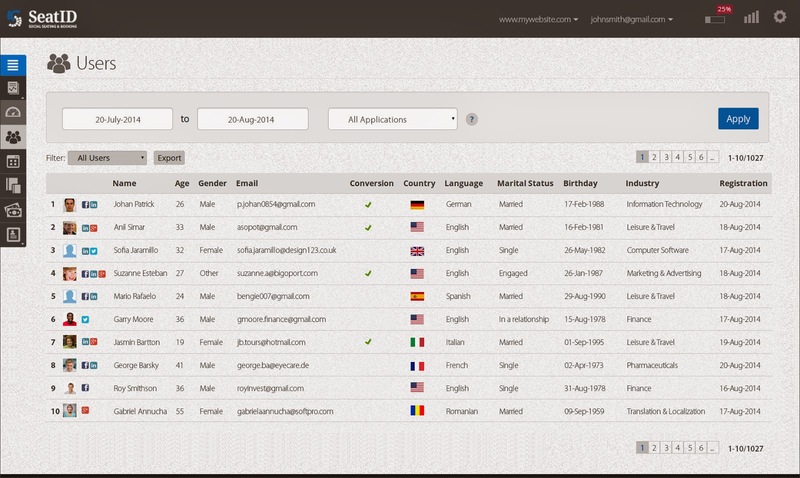 We automatically update user records, to reflect changes made by the users. 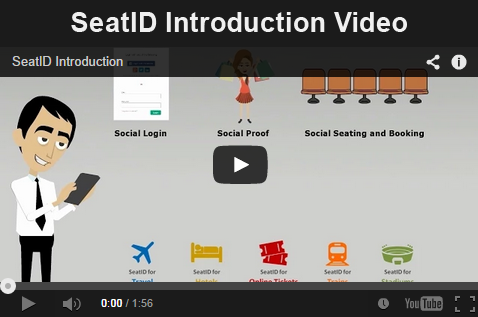 Come learn more about SeatID’s Social Login and Technology; We’d love to learn about your use-case and get your feedback. 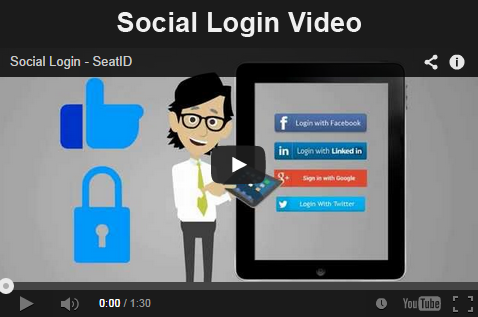 SeatID’s Technology enables Social Proof, Social Booking and Social Seating by leveraging easy opt-in of future customers on your website (Social Login) AND visibility into which of their friends and social circles have previously purchased from your company. Rolling out our solutions will remove obstacles standing between your brand and future customers, leading to improved engagement, conversions and more sales. Implementation is easy and takes only a few hours. Better know the needs of their website prospects, customers and guests on-location thanks to customer insights and data. Gain new fans and customers by leveraging their friends behavior and selections, using Social Proof and Social Booking technologies. Create tailor made, effective, campaigns to convert, sell and keep customers coming back for more. Businesses today use diverse methods for interacting with, acquiring, and retaining customers. The cornerstone of this effort is building and expanding an Opt-in 'House-list' for keeping in-contact, sharing offers and information via Email. Email Marketing involves reaching customers with a marketing message or campaign via email. Effective Marketing, email-marketing included, relies on segmentation and targeting, i.e. Personalization. By adding social profile data, in addition to the name and email, Personalized marketing campaigns can address customer and prospects with messaging specific to their targets Gender, Age, Martial status and more, increasing the effectiveness and results of the marketing campaigns. With SeatID your business can address all three, automatically, collecting User social profile data, frictionlessly, via interactive social widgets on your website and on your WiFi network, providing your business a New opportunity, a new channel, to increase your reach, collect and learn valuable information about your most engaged users, customers and guests and the ability to use your SeatID account to Automatically send email campaigns to them. Email campaigns can be customized with your current Offer, Information and any Advertising/ Marketing messaging to promote your business and Increase Sales and customers engagement & Satisfaction. Come learn more about SeatID’s Technology, We’d love to learn about your use-case and get your feedback. SeatID’s Technology leverages easy opt-in of future clients on your website (Social Login) AND visibility into which of their friends and social circles have previously purchased from your company. Rolling out your Social proof with SeatID will remove obstacles standing between your brand and future clients, leading to improved engagement, conversions and more sales.